Summary: A response to the Lucky Number challenge, this is a 666-word fic about Radagast's view of his role among the Istari. Summary: : Gandalf learns of a deadless and nameless horror that haunts the Misty Mountains. Driven by a suspicion about an ancient evil, that was lost long ago, he desires to unveil the mystery. With the unwilling help of Haldir, Captain of Lorien, he embarks upon a dangerous and dark quest, that will lead him from the heights of the Misty Mountains into the depths of the pits of the Necromancer in Dol Guldur. Summary: Response to Susan's challenge about the five wizards and their robes. Please read and review. Constructive critisism welcomed. Summary: Radagast needs a little extra help to return to Valinor. Summary: Over the course of the Third Age, Saruman falls into evil, one step at a time, without even knowing it. Summary: Gandalf sneaks into Dol Guldur in order to rescue Thràin. Thirty years after the War of the Ring unrest has risen in the northeast regions of Middle Earth. Once more, the new aliances are called upon to restore peace. 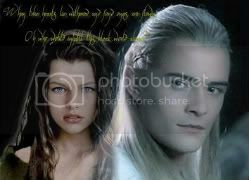 Through this, a young woman of Gondor embarks on her own quest to save the life of her beloved brother and reclaim a long lost friendship with an old familiar friend. On the way she'll test her knowledge, strength, and courage as she battles fearsome foes as well as her own internal demons to find her true place in Middle Earth.